36.2 acres on two conservation easements, located in southern Thurston County, just east of I-5. The Leitner Prairie Conservation Easements consist of south Puget Sound prairies on two parcels divided by Leitner Road. A wide diversity of native prairie herbaceous plants are present on site, including camas, violet, buttercup, cinquefoil and blue-eyed grass. The early blue violet provides nectar for the Mardon Skipper butterfly, which is state listed as endangered, proposed for federal listing, and found primarily in western Washington prairies. Numerous migratory birds also frequent the property. The property is a mitigation site for Mazama pocket gopher habitat. County—the region’s first. The easements protect the parcels from development and promote on-site pocket gopher habitat management. 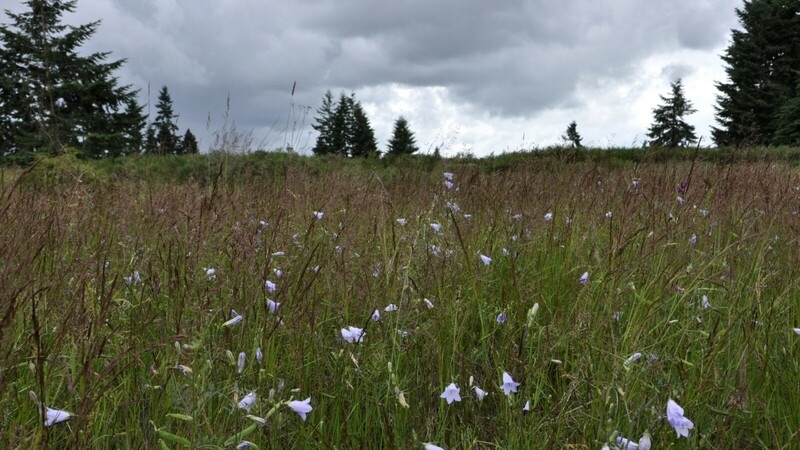 The Leitner property, near the Scatter Creek Wildlife Area, is part of the Grand Mound Prairie—named in 1853 for the large knoll rising from the landscape— and was historically dominated by native camas and bunch grasses, stands of Oregon white oak and Douglas-fir trees. The prairie was formed by interacting ecological and physical conditions that include ice-age gravel deposits resulting in porous, low nutrient soils, summer droughts, and periodic fires. Rapid population growth during the last century has resulted in the conversion of much of the prairie to residential, commercial and agricultural uses. Of the historical Puget Sound area prairie ecosystem, only two to three percent remain intact today. The Mazama pocket gopher is listed as ‘threatened’ in Washington State and is proposed for federal listing as an endangered species. Other subspecies of T. mazama in the Tacoma and Vancouver areas already may be extinct, so protection is crucial. The gopher is a prairie lands burrowing “ecosystem engineer,” profoundly benefiting these grasslands in several ways—enriching the soil, and enhancing native plant and animal diversity and abundance. By loosening the soil and leaving behind underground food caches and latrines, they can increase oxygen and available nutrients in the soil, effectively speeding the rate of plant decomposition and causing higher production of prairie plants. When gophers eat roots and above-ground plants, they alter the distribution of prairie species. In fact, plant species diversity can be between 5 and 48 percent higher where pocket gophers are present! Pocket gopher burrows also create retreats for other small mammals, invertebrates, and amphibians. Between the scattered Douglas-fir trees, Leitner Prairie contains herbaceous plants including camas, buttercups, cinquefoil, early blue violet and blue-eyed grass. Blue-eyed grass is an early bloomer and provides nectar for the Mardon Skipper butterfly, which is listed by the state as endangered, and proposed for federal endangered species listing. In addition, Leitner Prairie is habitat for a multitude of native bird species. Over the course of one visit, Guy Maguire, Capitol Land Trust’s Stewardship and Restoration Coordinator, observed golden-crowned and white-crowned sparrows, pine siskin, American goldfinch, common yellowthroat, Wilson’s warbler, blackcapped chickadee, chestnut backed chickadee, spotted towhee, northern harrier and a red-tailed hawk.